THE ‘CHILLING EFFECT’ – KOH TAO SUSPECTS SACRIFICED FOR BRITISH GOVERNMENT INTERESTS? CONSPIRACY TO MURDER – BY WIFE OF BRIT DRUGS FUGITIVE – confirmed! Seven people were injured including two journalists after gunmen opened fire at an anti-government demonstration in Bangkok today causing extreme concern over further, perhaps more serious, violence at a planned national election tomorrow. The violent scenes took part at the Laksi junction area of Bangkok as anti-government supporters attempted to disrupt the distribution of ballet papers. Several gunmen were caught on camera and video cameras. One of the injured journalists was named by AP as James Natchwey – fortunately his injury was minor. A bullet grazed his leg. He was shot on an overhead road, its claimed. Hundreds of people dived for over when the shooting started. A group of journalists had to be rescued from a police box. The army has sent in 5000 troops to help with law enforcement. The protesters want an end to the government of Yingluck Shinawatra – which is believed to be controlled by her brother, who has been exiled after fleeing corruption charges. 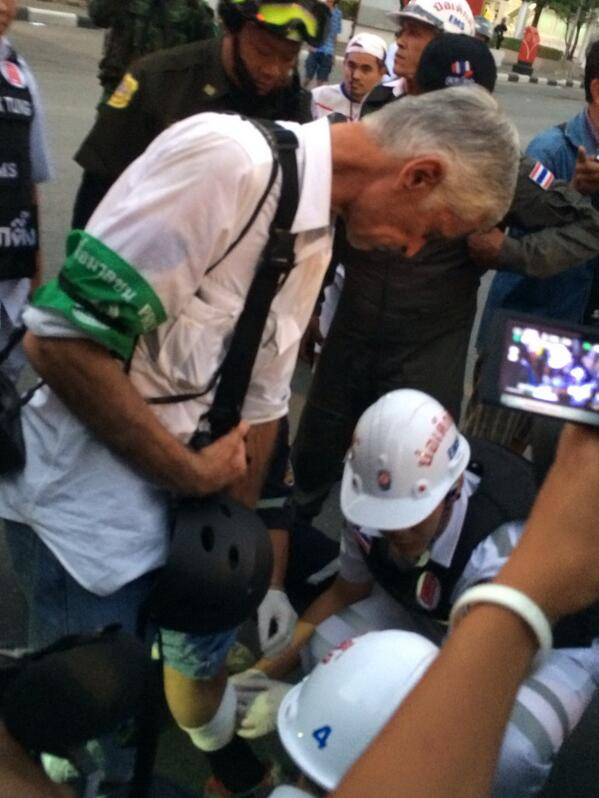 Some of the gunman were wearing PDRC green armbands which have been the subject of a protest from the FCCT – Foreign Correspondents Club of Thailand as they look similar to the green press armbands issued to journalists. Andrew the gunmen in these videos are PDRC supporters. 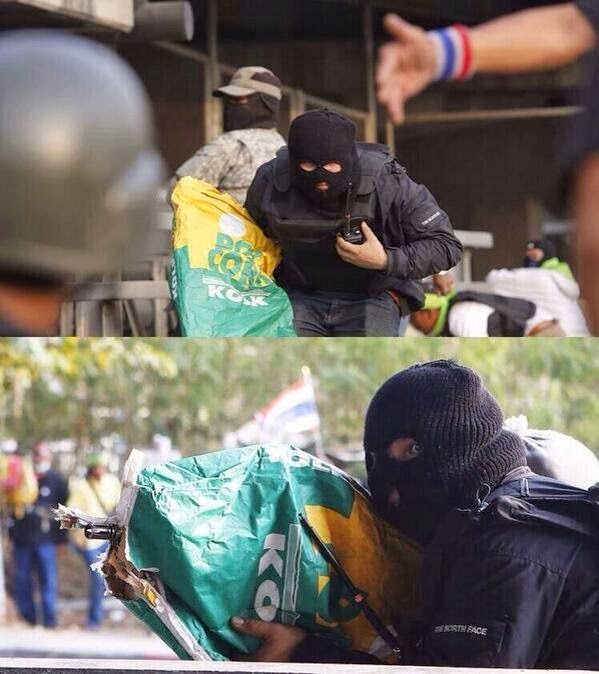 A PDRC truck drives behind the guy with the gun in the bag and he is shooting in the opposite direction of the PDRC supporters. Nachtwey will have some nice war stories to tell later…even a great bullet ridden leg to show off. So AD…where were you hiding and what were you wearing ? I was wearing an 'I love dad' sweatshirt – which I had to buy myself – and blue denim shorts, turned up above the knee. Matthew was as usual wearing a pair of fairy wings, Annie was wearing Mickey Mouse ears, and Archie was wearing his birthday suit. – The nanny is away – and has just returned to rescue me. The place is a mess half the house has been destroyed. . As a result I could not go near the demo, and as any journalist will tell you – if he is not a photographer – you cannot fully cover these occasions by being in one particular place. I have been to the demos five times – this weekend I have been locked – I locked myself into my office – and threw the kids the occasional crumb – (no that's not true I did them a delicious lunch – which I had to eat for my dnner – and have been broadcasting all day – to places – including some I have never been to. BUYERS OF THAI PARADISE HOME TOLD TO PAY AGAIN OR GO TO JAIL. MUM WHO SOUGHT JUSTICE FOR RAPED DAUGHTER FLEES THAILAND TWICE! Steven Mandala on BUYERS OF THAI PARADISE HOME TOLD TO PAY AGAIN OR GO TO JAIL.